This is another one of my favourite illustrations from the book. 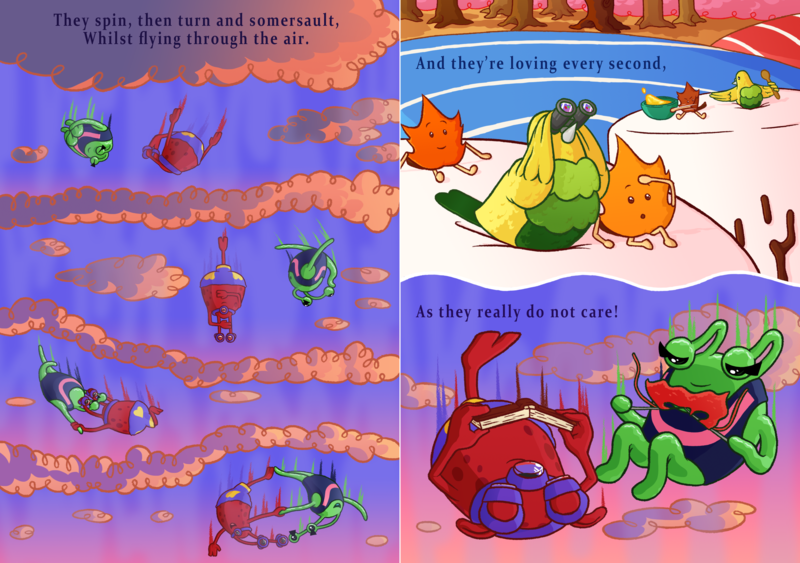 Based on the text, I knew I had to draw some exciting and fun poses for the two aliens as they make their skydiving event. So I played around with various poses that I thought suited them because of their unique movements based on their designs. For instance, they’re both roundish, so I wanted one of their poses to incorporate spinning. And as they’re a couple, I wanted to show some duo poses as well. This is one of the few spreads in the book that is split into two pages instead of being one full illustration that spans two pages. This is because the contents of the paragraph for this spread had too much information to contain in just one image. It needed to show Mr. Love and Mrs. You in many poses, as well as get a view of the spectators watching their dive (these characters are introduced earlier in the book by the way). To make the scene feel more windswept, I added in opaque cloudy lines that emphasise the speed at which they’re falling. Also, if you read the book from beginning to end, you might notice the sky is changing colour throughout. This is to indicate the passing of a day. From dawn, to morning, to afternoon, to dusk, to night. At this point, the sky is turning purplish and dusk is setting in. This is a little feature I’m proud of myself for including, as it gives the story a better sense of pacing.